Jessi's Design: Favorite Things: Stocking Stuffer Edition! Thanks to Elise at Cheer's Ya'll & Jen with Down with the Dearmore's- it's time for Favorite Things Tuesday link-up again and this week we are covering stocking stuffers ya'll! I'm pretty simple when it comes to stockings (I basically just love being stocked with bathroom/beauty supplies and candy haha) so I'll focus on me for a sec but I want to focus on MEN! All the men in my life (my hubs, my Dad) seem so hard to shop for! They're the ones that always say "I don't need anything" or "Don't buy me anything" etc. etc. so I've been doing some research and I've come up with some neat items! 1. Anything sour gummy related! 2. Annnd again 3. Love basic Olay products 4. Dogeared necklaces are always great and compact too 5. Alex & Ani bangles anyone? 6. Cute wine glass markers for parties! 9. Chocolate Covered Bacon <--- yes please! I can't wait to read everyone's! men...THE WORST (but the best) thanks for these ideas for him!! I LOVE that you put candy on your list!! And those little pearl necklaces are so nice, I gave those to my mom, MIL, and one of my readers at my wedding as gifts, theyre so precious! 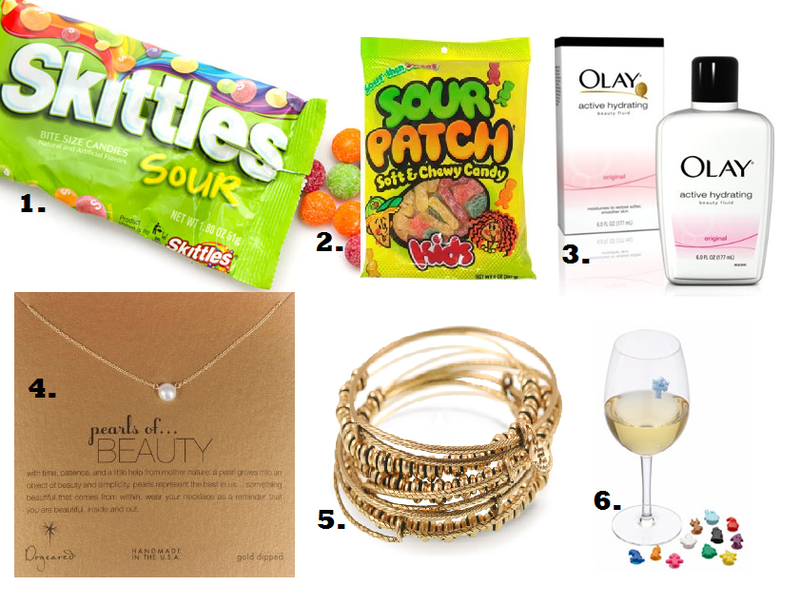 Mmmm that sour candy is calling my name ;) And those wine glass markers, amazing! I know- I'll take some now please! My stockings are always full of beauty products and candy, too!! And I love it haha! The Alex and Ani bangles are SO cute! I highly recommend the pocket knife for guys.. my husband has like 4 of them and carries them everywhere! I am dying over Alex & Ani bracelets this year! They are definitely on my wish list! I just got the oyster/baby pearl one and looove it!! LOVE Alex & Ani!!! And you are singing my song with all that sour candy. :) Great ideas for the guys too! Got my dad that bacon chocolate last year and he loved it! I think I would even love chocolate bacon!! haha Thanks for stopping by!! Guys are so hard to buy for. I love your stocking stuffers though! oh yes it's my weakness for sure! I love the pearl necklace and the Alex and Ani bracelets. I am obsessed. And I agree. Guys are so hard to buy for. Good ideas! Olay products are the best! And the wine markers are such a good idea. Thanks for sharing the men's ideas too. They are almost impossible to shop for! Loving it all!!!! The money/tool kit is perfect!! Might have to add that to hubby's stocking this year! ;)) And chocolate covered bacon, yes mam!!!! Brilliant! Love the wine markers too! So fun! Thanks for linking up with us!!! Hi, Friend! :) Thanks for finding me on here! You and your wedding were beautiful as well! My brother got married the same day as you on our farm. I'll have to share pictures sometime. Congrats! So excited to follow along! Happy holidays! You had me with the sour Skittles and Sour Patch kids! And how darn cute are those wine markers! Love your list! Yes, men are so hard to buy for!! Thanks for the ideas!! And a bacon bar? I am pretty sure I need that in my stocking! Love anything sour gummy!!! Thanks for then ideas if men!! I had no idea what to put in the husband stocking! Those ideas are perfect!! 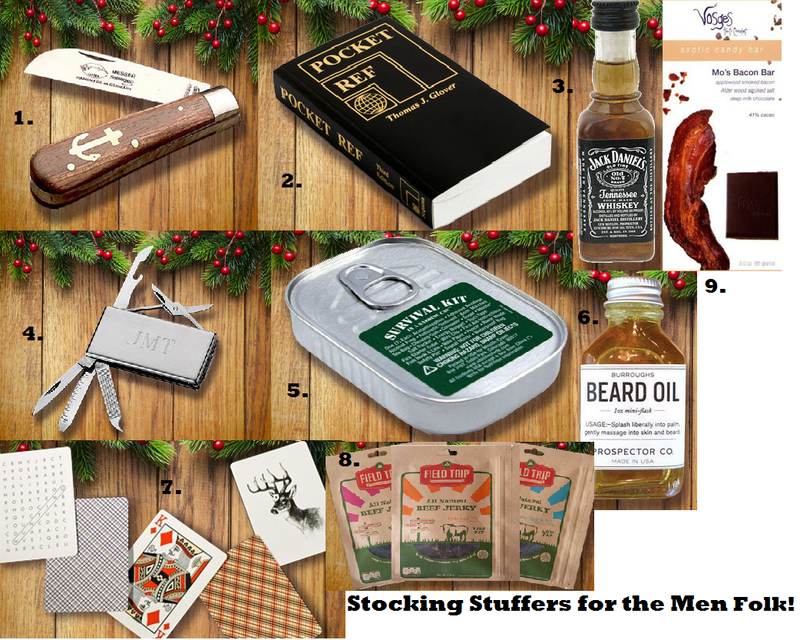 You pulled together the PERFECT guy stocking list! Thanks April! Have a fabulous Thanksgiving!! LOVE those bracelets! Those wine markers are so cute too - just found your blog - so happy to find another wine lover's blog :) new follower. Have a great day! I love sour patch kids! I can eat them until my tongue starts hurting from all the sugar! Those wine clips are adorable! 1. sour patch kidz are NUMBER 1. 2. thank you so much for sharing your stocking stuffer ideas for the men in your life! this will be my first christmas with a husband and i was at a lost. thank you! Thanks Tammy Jo!! How does it work?